I gCill Mhichíl, Co. an Chláir, a rugadh é ar 24 Eanáir 1869. 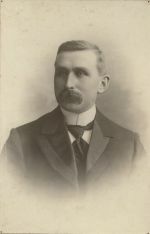 Bhí feirm ag a athair Séamus (1831–1911) i Leacain sa pharóiste sin agus b’as an bparóiste céanna dá mháthair Áine Nic Oitir (1833–1914). Níor chainteoirí dúchais Gaeilge iad, deir a muintir. Bhí beirt dheirfiúracha ag Seán, Susan (1871) agus Ellen (1874), agus deartháir amháin Séamus a rugadh ar 17 Iúil 1876. D’éirigh leis dul isteach sa státseirbhís tuairim 1884, sin nó bhí sé ag staidéar le haghaidh poist ann i rith na bliana sin. Is é traidisiún na clainne gur thaistil sé in éineacht le Micheál Cíosóg go Durlas Éile an lá a bunaíodh Cumann Lúthchleas Gael. Ní raibh na sé bliana déag slán aige san am ach d’fhéadfadh sé bheith fíor go raibh sé ag freastal ar Acadamh an Chíosógaigh i mBaile Átha Cliath agus é ag pulcadh le haghaidh scrúdaithe na státseirbhíse. Faoi Fhómhar 1893, tamall an-ghairid i ndiaidh bhunú Chonradh na Gaeilge, ceapadh é ina chomhchisteoir in éineacht le Seosamh Laoide agus bhí sé ina bhainisteoir ar Irisleabhar na Gaedhilge ar feadh tamaill. Bhí baint mhór aige leis an eagraíocht go ceann tuairim deich mbliana. I rith na tréimhse sin rinne sé staidéar ar an teanga i gColáiste Ollscoile Bhaile Átha Cliath faoin Athair Éamonn Ó hÓgáin agus bhain céim B.A. (An Ollscoil Ríoga) amach in 1898. Chabhraigh sé leis an sagart chun Luibhleabhrán a ullmhú. Ó 1900 amach bhí post sinsearach aige i Roinn na Talmhaíochta. Phós sé Adelaide Mary Boland ó Chluain Meala agus bhí cúigear clainne acu. Fuair Adelaide bás i ngeimhreadh 1901 agus gan ach 31 bliain d’aois aici. Bhí duine de na leanaí nach raibh saolaithe ach le cúpla seachtain. Mí roimh a bás-san cailleadh a dheartháir Séamus a bhí an-ghníomhach i gcraobh Chill Mhichíl den Chonradh. Pairneilíteach ba ea é ach ní raibh aon spéis sa phoblachtánachas aige. Chreidtí nach gcuirfeadh sé a mhic chuig Scoil Éanna toisc nár thaitin polaitíocht an Phiarsaigh leis. D’fhág sé an státseirbhís ar pinsean faoi fhorálacha an Chonartha Angla-Éireannaigh. Bhí sé i bpáirtíocht le Seosamh Laoide ag cur eagair ar Teacht agus imtheacht an ghiolla dheacair agus toruigheacht Chonáin agus a chuideachtan (1905) agus ar Brisleach mhór Mhaighe Mhuirtheimhne (1907). Scríobh sé Conntae an Chláir (1938) agus bhí sé ag scríobh leabhair ar logainmneacha na hÉireann ach níor éirigh leis é a chríochnú. Bhí stair a mhuintire féin siar go dtí an 12ú céad scríofa aige ach níor le haghaidh a foilsithe. D’éag Seán Ó hÓgáin ar 12 Iúil 1947.